Received 2018 December 5; Accepted 2018 December 26. Traditionally, the morbidity and mortality conference (M&MC) is a forum where possible medical errors are discussed. Although M&MCs can facilitate identification of opportunities for systemwide improvements, few studies have described their use for this purpose, particularly in residency training programs. This paper describes the use of M&MC case review as a quality improvement activity that teaches system-based practice and can engage residents in improving systems of care. Internal medicine residents at a tertiary care academic medical center reviewed 347 consecutive mortalities from March 2014 to September 2017. The residents used case review worksheets to categorize and track causes of mortality, and then debriefed with a faculty member. Selected cases were then presented at a larger interdepartmental meeting and action items were implemented. Descriptive statistics and thematic analysis were used to analyze the results. The residents identified a possible diagnostic mismatch at some point from admission to death in 54.5% of cases (n= 189) and a possible need for improved management in 48.0% of cases. Three possible management failure themes were identified, including failure to plan, failure to communicate, and failure to rescue, which accounted for 21.9%, 10.7 %, and 10.1% of cases, respectively. Following these reviews, quality improvement initiatives proposed by residents led to system-based changes. A resident-driven mortality review curriculum can lead to improvements in systems of care. This novel type of curriculum can be used to teach system-based practice. The recruitment of teaching faculty with expertise in quality improvement and mortality case analyses is essential for such a project. The morbidity and mortality conference (M&MC) is traditionally utilized in academic medical centers as a forum to identify and discuss adverse events. Despite its long-standing tradition, the M&MC has 2 main flaws. First, the considerable variation in the structure of these conferences means that there is little consensus on the goal, method, and format . Second, the literature regards the M&MC as a crude means of addressing errors since many adverse events are identified through other processes and are often not reported in M&MCs [2,3]. M&MCs have been further criticized for being a public forum for blame allocation . Many institutions have restructured their M&MC format to identify and implement improvement initiatives and to sharpen a focus on mortality reduction through system improvements [5,6,7]. Nonetheless, the literature indicates that M&MCs rarely lead to system-based actions [1,8,9]. A survey of US internal medicine residency programs revealed that most programs contained MM&Cs as a traditional forum to discuss medical errors and pathophysiology related to adverse events and deaths. However, only half of the residency programs had established a process for handling and following up on the errors identified in these conferences . The Accreditation Council for Graduate Medical Education (ACGME) mandates as a core requirement that residents participate in quality improvement projects and ‘understand common principles and techniques of quality improvement’ . Participation in clinical case review and peer review is a fundamental component of the contributions made by physicians-in-training to quality improvement. Although research has investigated how to involve residents in patient safety and peer review through the M&MC format, few studies have described the process of engaging residents in real-time patient case reviews focused on mortality. This paper describes the process of planning and implementing a resident-driven mortality case review curriculum to teach residents how to critically analyze factors associated with in-hospital mortality and to increase engagement in quality improvement initiatives related to mortality prevention. We also report results regarding the nature of potential system errors identified by residents and the actions taken by the department of medicine in response. The Institutional Review Board of University of Florida approved this study as a quality improvement project (QIPR Project ID 182). After IRB approval to study the curriculum, (IRB201701579) the learners were surveyed about the curriculum anonymously and with informed consent. 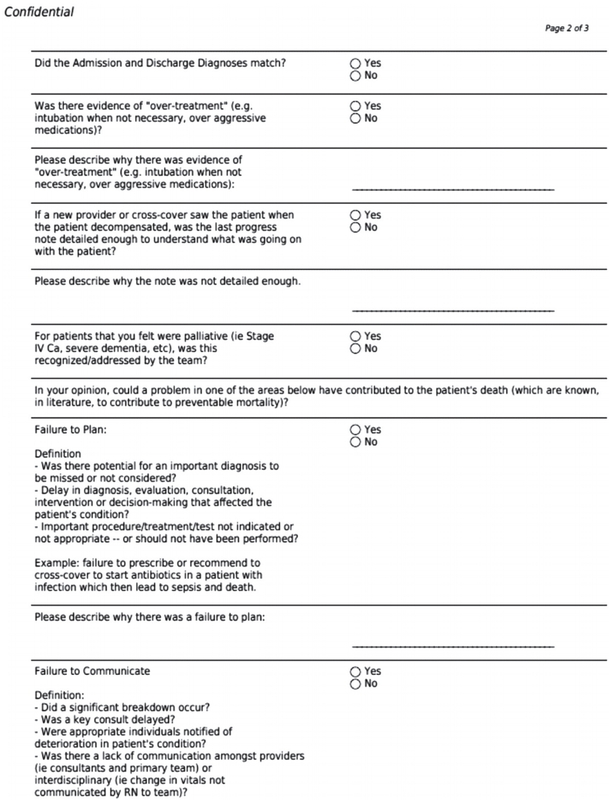 In 2010, to understand factors associated with preventable mortality, an inter-professional team of physicians, pharmacists, nurses, and quality analysts at the University of Florida Health Hospital adapted the Kaiser Permanente Mortality Review Tool to perform a pilot review of 50 inpatient deaths among patients with advanced illness [11,12]. The review sought to answer 3 questions: (1) Was there evidence of failure to rescue the patient? ; (2) Was there evidence of failure to create contingency plans for patient decompensation? ; and (3) Was there evidence of failure to communicate among the practitioners caring for the patient? Although most deaths occurred as a consequence of underlying progressive deterioration of comorbid conditions, some deaths were potentially preventable due to failure of rescue (i.e., failure of early transfer to the intensive care unit or to perform other escalations of diagnostic and therapeutic interventions). Prior studies noted that cases of failure to rescue can result from diagnostic errors, failure to coordinate care among physician specialties, and communication breakdowns . Early warning systems were subsequently implemented and the department of medicine M&MC was restructured to focus on these cases. While our medicine residents attended these M&MCs, their experiential training on patient safety was limited to a 1-month quality improvement/patient safety curriculum modeled on the Institute of Health Improvement (IHI) Open School during their yearly ambulatory rotation. In our 2015 program survey, only 83% of medicine residents felt that they had participated in quality improvement activities. In response, departmental experts in patient safety, along with the residency program directors, designed and implemented a monthly resident-driven mortality case review curriculum. This curriculum takes place during the ambulatory rotation of the University of Florida Internal Medicine Residency Program in Gainesville, Florida. Based on the above logic, participants reviewing cases were participating in a quality review project, and this was clearly stated prior to case review. We utilized the ‘IHI Move Your Dot’ framework to plan the new format of our M&MC and to design our mortality case review curriculum. This framework helps to inform a hospital’s organizational performance related to mortality. The key principle of this framework involves case-based analysis to identify local system issues that can be improved [6,7]. Development of the case review worksheet: Using the Move Your Dot framework, residents used a case review worksheet to categorize and track mortality cases into categories of management failure that were identified during case reviews (Fig. 1). Longitudinal data from each worksheet were tracked in the online HIPPA-compliant Research Electronic Data Capture (REDCap) platform. Mortality case review process and sessions: Cases were selected to include every instance of mortality from the general medicine teaching service. Residents reviewed every mortality case from the medicine teaching services and identified areas for improvement in diagnosis and management using the mortality worksheet during their independent review of the cases. Residents then met with a faculty mentor to discuss the cases and to analyze potential problems in medical management that impacted mortality risk. The debriefing session consisted of a brief case presentation followed by a discussion of whether the cases involved any of the categories of failure that had been noted. There was also a discussion of the categories of failure. During these debriefing sessions, residents proposed potential action items to prevent similar mortality issues. Mortality cases in need of further review were subsequently forwarded to an executive committee or interdepartmental conference specifically organized to discuss the case and to develop action items for improvement (Fig. 2). A synthesis of these in-depth discussions and analyses of mortality cases led to a consensus regarding action items to implement to address systemwide issues. Fig. 3 presents an actual example from the conference and actions taken. 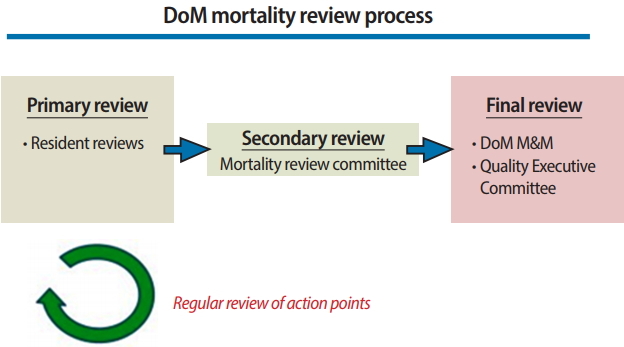 DoM mortality review process. DoM, department of medicine. Example of a mortality event and actions generated by the resident-led team. Case review data on mortalities from the medicine teaching services were analyzed. Descriptive statistics were used to analyze the numeric data regarding mortality and management failure categories. To organize and index the data set, 2 of the authors (NSR and ZZ) initially coded the data. The Braun and Clarke  framework of qualitative thematic analysis was used to analyze the open-ended responses. Following the 6 phases described by Braun and Clarke , we independently analyzed the data and identified management failure themes, focusing on patterns and richness of responses rather than the number of responses, and assigned comments to themes. Another author peer-reviewed the themes for accuracy and an audit trail was maintained with comments. From March 2014 to September 2017, 347 consecutive mortality cases were reviewed by 107 internal medicine residents. The residents identified a possible diagnostic mismatch at some point from admission to death in 54.5% of cases (n= 189) and a possible need for improved management in 48.1% of cases (n= 167) (Table 1). 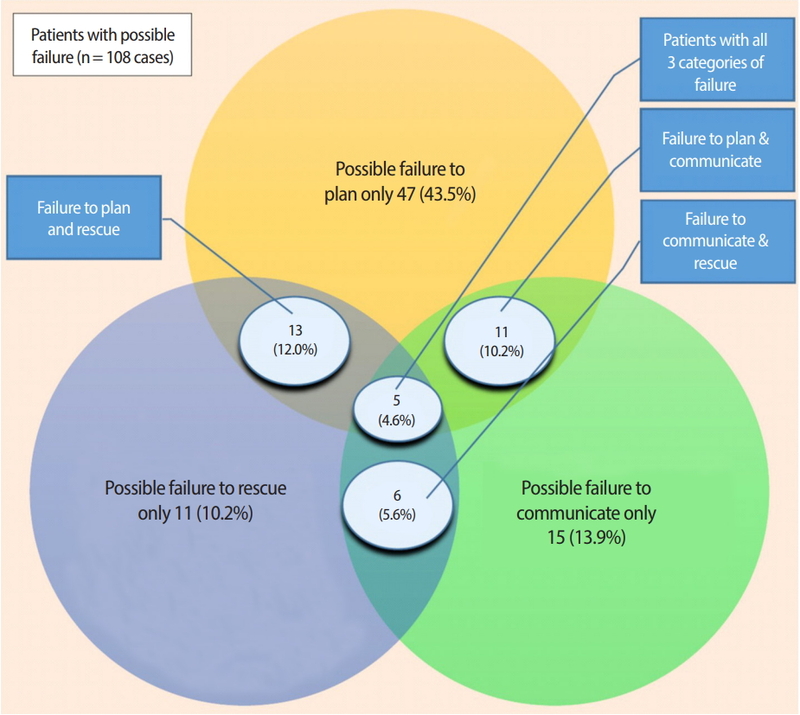 Three possible management failure themes were identified, including failure to plan, failure to communicate, and failure to rescue, which were implicated in 21,9% (n= 76), 10.7% (n= 35), and 10.1% of cases (n= 35), respectively. Three additional themes were identified including possible overtreatment (9%, n= 32), documentation issues (12%, n= 41), and lack of involvement of the palliative care team (19%, n= 67). The categories of possible failures were not mutually exclusive and many of the cases had multiple categories that overlapped. A total of 108 patients had 1 or more possible failures (31.1%). Of these 108 cases, 73 (21.0%) had a single category of failure and 35 (10.1%) had more than 1 category of failure. Eleven cases (10.2%) had possible failures to plan and to communicate. Six cases (5.6%) had possible failure to communicate and to rescue. Thirteen cases (12.0%) had possible failures to plan and to rescue. In 5 cases (4.6%), all 3 categories of possible failure were identified (Fig. 4). The raw data are available in Supplement 1. 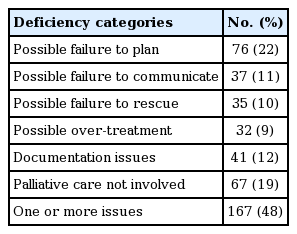 Overlap of failure categories in the 108 cases with a possible failure. Theme 3, possible failure to rescue, had 2 sub-themes, relating to delays in the recognition of deteriorating vital signs and inappropriate responses to changes in patients’ clinical condition. Herein, we describe the educational value of our innovative mortality case review curriculum to teach residents and drive systembased improvements for mortality reduction. Through facilitated reviews of real-life cases of mortality, residents were able to identify management failure themes. Approximately 50% of cases involved possible failure to plan care, communication issues with team members, and failure to rescue the patient prior to a terminal event. A ripple effect of the residents’ critical analyses of real-time decisions involved in these cases of mortality was the proposal of quality improvement initiatives leading to system-based changes. Our curriculum contributes to the current literature demonstrating that residents can be successfully involved throughout the quality process. Tad-Y et al. described a process for a system-based M&MC with interprofessional and interdisciplinary participation that led to action items. Trainees attending the conference completed a modified fishbone diagram. A core team debriefed after the M&MC conference and followed up on suggestions and actionable items. Kwok et al., described a hospital-wide structured M&MC, with representation from ‘high-impact’ clinician groups and ‘core specialty’ representation . Our curriculum is unique in that the residents were active participants in critically reviewing actual patient charts, documenting their findings regarding diagnostic errors, and proposing potential action plans. They then advanced to interdisciplinary teambased debriefings of the mortality cases including pharmacy, nursing, and subspecialty physicians from various departments. Examples of the action items created include a protocol for management of intracranial hemorrhage (Table 2), a process for early involvement of the palliative medicine team with terminally ill patients, and a protocol for early sepsis alerts. Since we found physician-to-physician and nurse-to-physician communication possible failures, we introduced a HIPAA-compliant secure text messaging application for smartphones. During the implementation of our new curriculum, the mortality index (observed/expected [University Health Consortium/Vizient]) for the department of medicine improved from 1.21 to 0.7 (Fig. 5). However, as multiple other quality initiatives were undertaken in the hospital system, we cannot be sure to what extent the action items generated from the mortality reviews resulted in the decrease of our mortality index-enhanced. The mortality index (observed/expected [University Health Consortium/Vizient]) for the DoM. DoM, department of medicine; UF, University of Florida. A limitation of our curriculum was the lack of resident continuity from the initial case review to the proposal of action items and final system-based implementation. This limitation was unavoidable due to the residents’ schedule and the lag time needed to implement system-based changes. Future directions may include an electronic learning management system that could be used to track which case was discussed and allow for direct feedback and discussion on a message board. This would obviate the need for the residents’ physical presence to receive feedback. Given the experiential teaching focus of our curriculum, we did not directly assess the impact of the curriculum on residents’ patient safety education (i.e., residents’ perception or knowledge improvement on the M&MC process and principles). Nevertheless, our curriculum applied adult learning principles for residents to critically analyze and identify mortality causes and engage in change management. The recruitment of teaching faculty with expertise in quality improvement and mortality case analyses is essential for such a project. A key lesson we learned was the importance of identifying and recruiting a small group of core faculty with expertise in quality improvement and a strong interest in teaching learners. We also emphasize the importance of early buy-in and close partnership with the residency program directors and hospital administration. To implement a similar mortality case review curriculum and M&MC redesign, we recommend early involvement and buy-in from the Office of Graduate Education, the Departmental Quality Improvement leaders, and the Senior Dean for Clinical Affairs. Future directions for this curriculum include having resident teams, ideally with representation from each post-graduate year, work on longitudinal action items. Each team should have a faculty mentor and designate ‘resident quality champions’ to work on action items identified through case reviews. These quality teams of faculty, residents, and interprofessional representatives could conduct longer quality projects. In conclusion, our resident-led mortality case review curriculum not only satisfied the ACGME’s requirement of experiential quality training for residents, but also promoted system-based improvements within the institution. We encourage residency programs to build similar curricula and have mechanisms in place to engage residents in the institutional mortality review process. Conceptualization: NR, ER, ML, RL. Data curation: RB, SS, NR, ZZ, RL. Formal analysis: NR, ZZ. Funding acquisition: ZZ (Gatorade). Methodology: NR, ZZ, RB, ML, RL. Project administration: NR, RB, ML, SS, RL. Visualization: NR, ER, RL, ZZ. Writing–original draft: NR, ZZ. Writing–review & editing: NR, RB, ER, ML, SS, RL, ZZ. Gatorade funds Dr. Zaidi’s position as Director Scholarship for the department of medicine. As this is not a grant, there is no specific grant number. The REDCap database was used to store data, which was made possible by grant support (NCATS grant UL1 TR000064). The authors would like to thank Ms. Megan Jacobson for her assistance with formatting this manuscript. 1. Orlander JD, Barber TW, Fincke BG. The morbidity and mortality conference: the delicate nature of learning from error. Acad Med 2002;77:1001–1006. https://doi.org/10.1097/00001888-200210000-00011. 2. Thompson JS, Prior MA. Quality assurance and morbidity and mortality conference. J Surg Res 1992;52:97–100. https://doi.org/10.1016/0022-4804(92)90285-8. 3. Leape LL. Error in medicine. JAMA 1994;272:1851–1857. https://doi.org/10.1001/jama.272.23.1851. 4. Bosk CL. Forgive and remember: managing medical failure Chicago (IL): University of Chicago Press; 2003. 5. Tad-Y DB, Pierce RG, Pell JM, Stephan L, Kneeland PP, Wald HL. Leveraging a redesigned morbidity and mortality conference that incorporates the clinical and educational missions of improving quality and patient safety. Acad Med 2016;91:1239–1243. https://doi.org/10.1097/ACM.0000000000001150. 6. Jarman B, Nolan T, Resar R, ; Institute for Healthcare Improvement. Move your dot: measuring, evaluating, and reducing hospital mortality rates Cambridge (MA): Institute for HealthCare Improvement; 2003. 7. Whittington J, Simmonds T, Jacobsen D. Reducing hospital mortality rates (part 2) Cambridge (MA): Institute for Healthcare Improvement; 2008. 8. Deshpande JK, Throop PG, Slayton JM. Standardization of case reviews (morbidity and mortality rounds) promotes patient safety. Pediatr Clin North Am 2012;59:1307–1315. https://doi.org/10.1016/j.pcl.2012.08.002. 9. Kravet SJ, Howell E, Wright SM. Morbidity and mortality conference, grand rounds, and the ACGME’s core competencies. J Gen Intern Med 2006;21:1192–1194. https://doi.org/10.1111/j.1525-1497.2006.00523.x. 10. Accreditation Council for Graduate Medical Education. ACGME common program requirements: section VI with background and intent Chicago (IL): Accreditation Council for Graduate Medical Education; 2017. 11. Classen DC, Lloyd RC, Provost L, Griffin FA, Resar R. Development and evaluation of the institute for healthcare improvement global trigger tool. J Patient Saf 2008;4:169–177. https://doi.org/10.1097/PTS.0b013e318183a475. 12. Lau H, Litman KC. Saving lives by studying deaths: using standardized mortality reviews to improve inpatient safety. Jt Comm J Qual Patient Saf 2011;37:400–408. https://doi.org/10/1016/S1553-7250(11)37050-X. 13. Gould D. Promoting patient safety: the rapid medical response team. Perm J 2007;11:26–34. https://doi.org/10.7812/tpp/07-101. 14. Braun V, Clarke V. Using thematic analysis in psychology. Qual Res Psychol 2006;3:77–101. https://doi.org/10.1191/1478088706qp063oa. 15. Kwok ESH, Calder LA, Barlow-Krelina E, Mackie C, Seely AJE, Cwinn AA, Worthington JR, Frank JR. Implementation of a structured hospital-wide morbidity and mortality rounds model. BMJ Qual Saf 2017;26:439–448. https://doi.org/10.1136/bmjqs-2011-000273.